Managing diabetes and pregnancy in 2010 and then again in 2016 was a lot of hard work, and my story is similar to so many moms in the diabetes community: a heavy focus on blood sugars, piles of doctor appointments, and dozens of tests for mom and baby. Today’s management of diabetes and pregnancy is very different than what was available 30-something years ago. Which is why I’m thrilled that my friend and fellow mom with diabetes, Laddie from Test, Guess, and Go, offered to share her story about what diabetes and pregnancy was like 30 years ago. Laddie held on to an incredible amount of information regarding her pregnancies, which is why I’m breaking her guest post into two sections; I didn’t want to leave anything out but I didn’t want anyone’s finger to fall off from scrolling. 🙂 Here’s part one of her incredible journey. Like everyone in the DOC, I’ve followed Kerri’s pregnancy diaries with smiles, tears, and warm fuzzies in my heart. I’ve watched her hard work optimizing blood sugars and the intense and state-of-the-art medical care. I’ve delighted in the joy of her posts and the depth of her love for her children. At the same time I’ve always felt a little sad at how much fear and self-judgement was mixed in with the good stuff. I can’t pretend that I don’t have 40 years of diabetes inner demons, but sometimes my rose-colored glasses allow me to forget them. Unfortunately diabetes loves guilt and blame and few of us are exempt from its demands. I’ve never been able to read the pregnancy narratives of Kerri and other T1 bloggers without a few chuckles at how different my childbearing experiences were. I am a woman with diabetes who had really big babies and no c-sections. That is not necessarily a good thing or anything to brag about, but it is my story. I had two children before the availability of home blood glucose meters and before the landmark Diabetes Control and Complications Trial that proved that good blood glucose control makes a difference in diabetes outcomes. As a mom-to-be in my late 20’s, I received no more intensive medical care than my gluco-normal friends. That was probably fine for my health but the risk to my babies was off the chart. I must stop here and confess that I can only tell my tale because it has a good ending. Two adult children and 6 grandchildren are testament to my good luck, the grace of God, and good medical care interspersed with less than optimal care. My story could have had a nightmare conclusion and it scares me how close we came to losing our second son. With a seven-year old daughter and a son not yet one, Kerri’s memories of pregnancy are current and accurate. Suitcases of BG logs, Dexcom tracings, medical records, and insurance EOB’s allow her to neurotically detail how many doctors appointments she had during each pregnancy, how many miles she drove to and from Boston, and what her blood glucose numbers were every minute of every day. I have muddled memories and little way of knowing how accurate some of them are. I don’t have medical records from those years but do have itemized medical bills, handwritten spreadsheets, and faded photos. For the most part anything I write here will be a combination of fuzzy recall along with a “Follow the Money” analysis of my paperwork. What kind of preparing did you do diabetes-wise? The answer is a straightforward “Not a darn thing!” I was diagnosed with diabetes when I was 24 years old and have a vague recollection of my GYN telling me not to delay pregnancy because it would be easier sooner rather than later. I wasn’t afraid of pregnancy because I was naive about diabetes and had few books, no community, and no Internet to remedy that. Unlike women like Kerri who were diagnosed as children, I didn’t have years of doctors warning me about the dangers of pregnancy. I had no Shelby-dies-nightmares because Steel Magnolias hadn’t been released yet. As far as I know, I didn’t do anything special related to diabetes to get ready for pregnancy. I suspect that because of my apparent good health and the short duration of my diabetes, my doctor underestimated the care that I should have received and did not refer me to an endocrinologist or a high-risk obstetrical practice. With no home BG monitoring, I’m not sure what options there would have been to “intensify” my diabetes management. During my first pregnancy I took 1 or 2 injections of Lente insulin a day. Pharmacy records show that Regular insulin was added to my regimen before my second pregnancy, but I’m sure it was a fixed mealtime dose. I was probably advised to follow my Exchange Diet as best I could. How did your OB/GYN handle your diabetes alongside the pregnancy? I hate to say that I don’t know a lot about this except that I think urine tests were performed at each visit. Why do I remember this? Because one of my most vivid memories is drinking a ton of water on OB days and then going to the library near the OB’s office for a final pee before showing up at my appointment. This was all so that when I peed on a strip at the OB office, the pad might remain light blue instead of changing to the dreaded dark brown. Although I keep saying that diabetes education was minimal in those days, I obviously knew enough to try to hide what my blood sugars were doing. Too bad the developing babies in my womb weren’t fooled by the drink-a-lot trick. Did you check your BG more? Cue the laughter track. I did not get my first home BG meter until my youngest son was 3 years old. Were you using a urinalysis kit? Yes. When I was diagnosed with diabetes in 1976, I used Diastix several times a day to check the sugar spill into my urine. I dutifully logged the result as anything from Neg. to 4+. People diagnosed before me and many diagnosed at the same time used Clinitest with drops of urine, tablets, and test tubes. I never used that. My hand-written spreadsheets indicate that urine strips were not reimbursed by insurance and I remember cutting them in half to save money. Did you see the doctor more often than your non-D counterparts? My copies of doctor bills indicate that I saw my internist about every 6 weeks for a Glycosolated HGB lab test (early version of A1c). I have no medical records to indicate the test results or my doctor’s advice. I do not think that I saw my obstetrician more frequently than other patients. I have few bills other than the comprehensive fee “OB Care – Total” and a couple of itemized lab tests. Fetal ultrasounds were extremely rare in those days and I did not have them. The tech-iest excitement I had was hearing the baby’s heartbeat with a magnified stethoscope device. As someone who had two C-sections, I’d love to hear about labor with diabetes. These days few women with Type 1 diabetes carry their babies until 40 weeks. Doctors prefer to deliver early to minimize risks to mother and child. I went into labor with my Mike almost exactly on his due date and was sent home from the hospital I because I was not far enough along in labor. I have absolutely no memories of my blood sugar being a concern and my hospital bills collaborate that. For the entire 6-day hospitalization including labor & delivery, I was billed for 2 Lab Glucose tests. For my second son three years later I had more intensive care with a total of 3 Lab Glucose tests! I was new enough to diabetes for both deliveries to know that I would have been symptomatic for any low blood sugars and I don’t remember any. My children were born in the heyday of “natural childbirth” and I didn’t have pain drugs until close to delivery. My memories of labor are of pain. My memories of delivery are excruciating pain. To you moms who had C-sections and think that you missed the beauty of labor, don’t stress over it. Enjoy your healthy babies and believe me, it wasn’t all that beautiful. Join Laddie tomorrow for her story about the birth of her two sons, the story about “the yankers,” and what pregnancy was like then versus what she’s seen the DOC moms do now. Thanks for going back in time to revisit your beautiful babies, Laddie!! Diabetes Pregnancy: Now and Then, Part Two. Month 8,455 of Pregnancy. Diabetic Pregnancy: Third Trimester. Diabetic Pregnancy: 25 Weeks and Counting Slooooowly. The difference in care is scary. I had my first introduction into diabetes when I was diagnosed with gestational diabetes in 1979. I flunked the 5 hour GTT, but was only told to “watch your diet, no desserts.” That is seriously the only diabetes care that I got. Now I hear young mothers talking about anatomy scans and such, I find it amazing that my children and I survived. Wow! quite a difference! 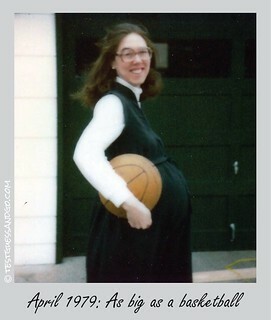 All of our stories of pregnancy w T1 diabetes are different because we’re each unique. Mine was in 1970, before home bg monitoring, “human insulin” and CGM’s. My daughter was born one week before my 23rd birthday, 15 years after diagnosis. The only advice I remember getting from the Internist was to reduce my daily coffee intake. I started seeing the OB as soon as I could get an appointment, two months after learning I was pregnant. I saw him once a month until the middle of the 5th month when I started having swollen ankles in the evening. From that point, until she was delivered by C-section, six weeks early, I had an appointment every two weeks to monitor my blood pressure. Meanwhile, I continued as best I could with daily activities, completing my last semester of undergrad studies. Having short stature meant that every ounce I gained as the pregnancy continued was very visibly apparent. By the 6th month I looked almost as wide as I was tall. My blood glucose management was really limited to eating less if my urine tests showed high. My morning U-40 Regular insulin amount had been increased after the first trimester, but I don’t remember anything else being changed. By the middle of July the edema in my legs was creating mobility issues. We used the bus system in San Francisco, didn’t own a car. I remember I had to call a cab to get to my OB appointment because I could no linger walk to the bus stop to catch a bus. As soon as the office nurse took my blood pressure reading the OB stuck his head in the door and told me I needed to go directly to the hospital. It was late afternooon on a Friday. I called my husband at work, told him I was going to the hospital by cab, please call my mom [in Kansas City] and meet me at the hospital. I rested at the hospital with a C-section scheduled for Monday morning at 9:30. I had known all along that I’d need to have a C-section because I’m 4′ 9″, the baby was going to be big and my hips “wouldn’t expand far enough” for a vaginal birth. Late Sunday evening my water suddenly broke, I had two minor contractions and by 6:30 Monday morning was in the delivery room. My daughter was born at 6:31 AM, all 19″, 7 lbs. 15.5 oz. of her. Because she was 6 week early she was placed in the preemie nursery for the first day and a half. We were released from the hospital 5 days later. Yes, I would like you Laddie! It’s all relative. The guest post and comments are immensely interesting. Waiting anxiously for Part 2 and more comments.